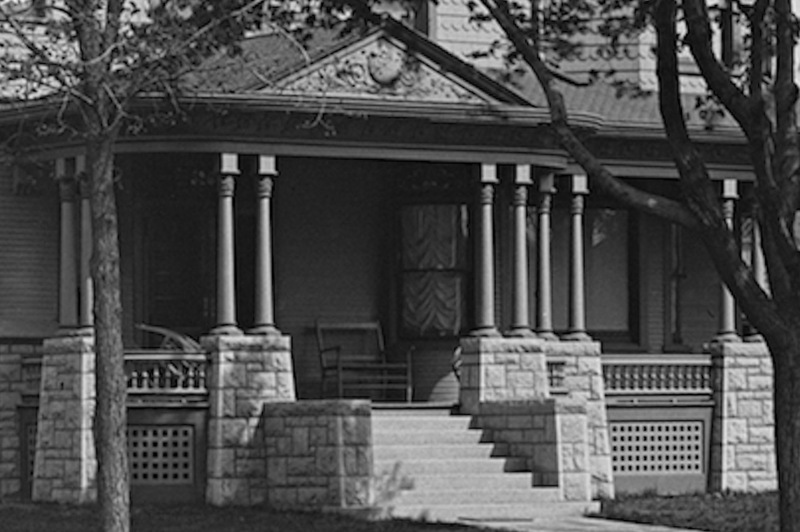 The Cross House front porch, when new in 1894. Of course, it is all intact. Deliciously, gorgeously, and fabulously intact. I spend way too much time staring at this image. Lustily. Longingly. The front porch, June 2014. Ahhh….it is no longer intact. Over the last 120 years columns have rotted away, porch railings have been removed, and the lattice seemingly moved itself to Florida, no doubt. In 2014, It is something of a miracle that the porch remains at all. 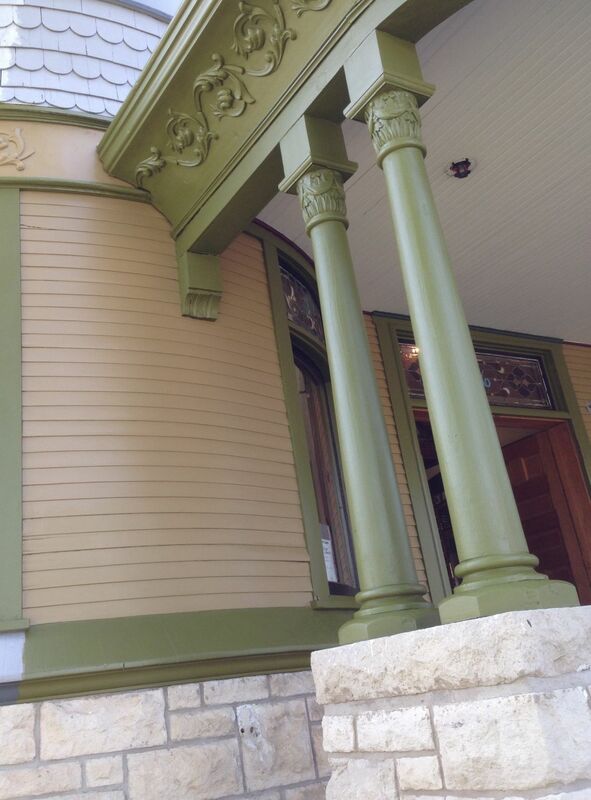 Almost all late 19th-century porches were wholly replaced at some point in the 20th-century. 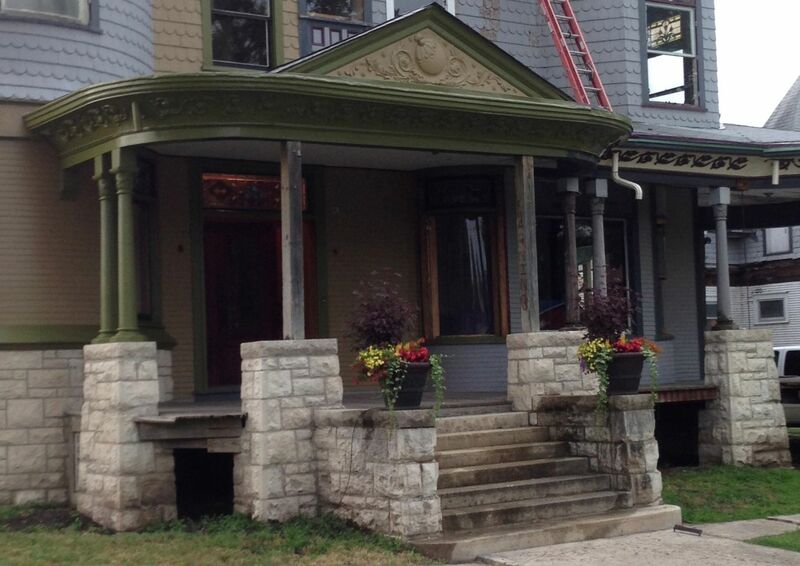 That the 120-year-old Cross House porch remains, albeit battered, is something I am deeply grateful for. Still, with so many bits missing, it is like looking at a beautiful woman, who smiles, only to reveal several missing teeth. The effect is, ah, diminished. So, too, with my front porch. There is no way to express how much this bothers me. I have no idea WHY I should be bothered as such. I mean, the house needs 4,567 things attended to STAT. The missing porch bits are not an emergency situation. Yet, I really really really want my porch made right again. Damn it. The columns are redwood. Geez. More than half are missing. I found most in the back yard. They were carried into the house, where they have spent months drying out. It developed that I only needed a few columns made. The columns sit on bases. I need a dozen, and these have been ordered. Above the columns are hand-carved redwood capitals. Geez. By some miracle only four were missing. Others need repair. The four missing capitals have now been recreated in some sort of space-age resiny material which, once painted, cannot be distinguished from the orginals. The delightfully low railings were in the basement. Most of the spindles are OK. Most of the rails are shot. These are being ordered next month. Luckily, a few bits of lattice remained, and these have offered an invaluable service as templates (when one owns a house like this, one cannot just run off to Home Depot and buy some lattice. Noooooooo, one has to precisely match the scale and thickness of the original lattice, damn the cost). One long straight section has now been made (for the north porch), and the rest are ordered. Most of this work is being done by a guy who owns a house comparable to the Cross House. Obviously, the guy is comparably insane to the owner of the Cross House. Well, kindred spirits are a lovely thing. Anyway, I am crossing my fingers that all these bits will be installed in 2015, and that the 1895 image and the 2015 image will match, but with the latter being in glorious color. Hence, my being breathless with anticipation. The redwood columns. I am in love with them to an unnatural degree. Hi Ross. I am totally loving the new color scheme! I’ve never been much of a fan for blue exteriors and when I first saw this house, I thought to myself that if I had it, I would change the blue colors. Great job! The new color scheme is actually an old color scheme! I am repainting the house in its original colors. It is exciting seeing the original scheme return bit by bit. In the black and white photo, the columns appear to be two colours. The hand carved capital and the ring above the base are the darker colour, while the rest of the column is the lighter colour. Why did you choose to paint the column one colour? If you keep reading, you will find that I did the columns a different way.